If you have been to the park or visited Salisbury, Massachusetts then you known that the place is all about the beach and the water. 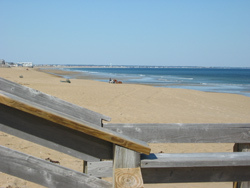 Salisbury Beach is one of the few places between Boston and Maine that provides public access to an expansive, sandy beach. A large portion of this state owned beach is bordered on its west side by private property that contains summer homes and rental properties. Only at the southern end of the beach - at Salisbury Beach State Reservation - does the state property wind along a large area of the coast. Here the state land boundary is largely defined by water: Black Rock Creek to the west, the Merrimack River to the south, and the Atlantic Ocean to the east. 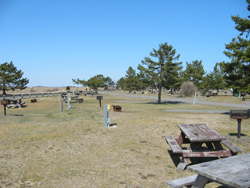 Some of the amenities the park provides include a campground, a few large parking lots for day-use beach visitors, and boat launching facilities. 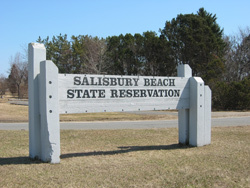 This website will provide you with the information you need to plan a visit to Salisbury Beach State Reservation and Salisbury Beach. Continue reading this page to obtain a general overview of what you can find in the park, use the navigation links on the left to find out more detailed information about the topics listed there, or jump around by clicking on the links that are found in the text below. 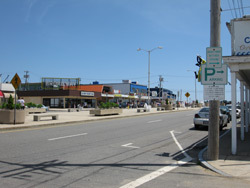 Following A1 into Salisbury Beach will bring you to Broadway Street. There are some parking lots, public and private, along with metered spaces in the street. Parking fees vary but expect to pay upwards of $10 or more for a space. Meters cost a quarter per ten minutes. Broadway ends at the beach and there are shops, places to eat, arcades and bars found here. There is a public bathroom west of the police station, which is just to the south of Broadway Street. Parking can be very difficult on a summer weekend or holiday. Unless you arrive very early or are lucky, expect to have to hunt for a spot. From Memorial Day weekend through Labor Day the park is open everyday from 8 AM to 10 PM. There is a per vehicle entry fee to enter the park ($14 for MA residents; $16 for non-MA residents). If you want to enjoy the beach it is well worth the cost. You can park anywhere in the large parking lots that provide ready access to the beach. 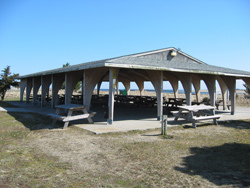 Around the parking areas you will find bathrooms, a place to change, outdoor showers, boardwalks that lead over the sand dunes to the beach, a picnic pavilion, and a children's playground. The park entry booth is also staffed when non-summer season camping is allowed but their hours are reduced. You do not need to pay any entry fee before Memorial Weekend or after Labor Day. There are 484 campsites in the state park- which is enough to make the campground resemble a small town during the busy summer season. The full-time campground season is early-May to mid-October. Off-season/late-season camping is available from mid-October to late November for Thursday, Friday and Saturday night stays. All the details can be found on the camping page. The reason, of course, why most people visit Salisbury Beach State Reservation! The main beach begins at the southern jetty and extends north for almost 4 miles. There are also a few smaller crescent shaped beaches found along the banks of the Merrimack River (there is no swimming allowed in the river) . The Reservation has two boat ramps. They are right next to each other and provide access to Black Rock Creek. The end of the creek, where it empties into the Merrimack River, is a stone's throw away. 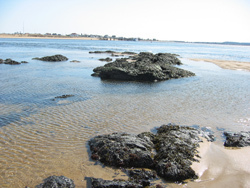 The mouth of the Merrimack, where it feeds into the Atlantic Ocean and divides Salisbury Beach from Plum Island, is just a few minutes away by boat. Both boat ramps are accessed from a small parking lot found southwest of the campground. There is no swimming allowed along the Merrimack River shoreline along the southern end of the park. This means fishing is allowed around the clock from the banks of the river there. Surf fishing from the Atlantic Ocean beach is permitted, but the times vary by the season. During the summer (Memorial day through Labor day) you can fish from the ocean shore from 5 PM until 10 AM. There is a single group picnic area in the park. 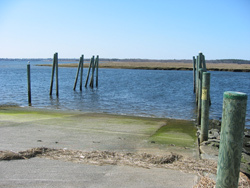 It is located at the far end of the parking area, close to the Merrimack River and not far from the Atlantic Ocean beach. The facilities are available, for a fee, by reservation. The facility includes a covered pavilion, numerous large grilles, and room to host up to 200 people. Restrooms are nearby and there is also a childrens playground in vicinity. To make a reservation you will need to call the park (see the number below). With a reservation you are allowed to use facilities from 8 A.M to 8 P.M. In the same area there are also 10 individual picnic tables that are available on a first come first served basis. Next to each of these tables is a small barbeque grill. 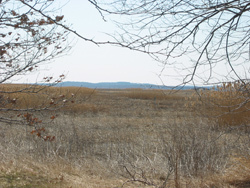 The park land was acquired by the state of Massachusetts in 1933. The property was purchased to insure the public would be able to have access to the coast. The source of the Merrimack River is in New Hampshire. The river winds it way for 120 miles before it reaches the sea at the southern edge of the Salisbury Park. The tidal flats and salt marsh found along the western edge of the park are part of an important, highly productive ecosystem. The juvenile stages of numerous marine fish begin their lives in the water's found in this areas (find out more about the salt marsh). Harbor seals can be seen in and around the mouth of the Merrimack River during the fall and winter. You can read a short overview about harbor seals or find a more detailed article about this species if you want to learn more about these interesting animals). The sand dunes you see along the back edge of the beach are important for stabilizing the beach. Even with dunes to help anchor them barrier islands are dynamic systems that often change in shape and size. Large storms tend to degrade the beach, which is then replenished in part by sand that fills in from the dunes. The dunes may then rebuild themselves during years when there are no strong storms. Despite this give and take, these processes proceed without regard to our human concerns - like trying to not have our houses fall into the sea when strong storms erode the beach and the dunes! The mouth of the Merrimack River, the mouth of Black Rock Creek, and the town of Salisbury have been drawing visitors to this area since the mid eighteen hundreds. "Great Gatherings" were held every September for many years and attracted thousands of people . The gatherings were essentially a big party and visitors came to be entertained by various shows, hear speeches, have reunions, and simply enjoy a grand social event (a news article about one of the great gatherings). The out of print book "Salisbury Beach, 1638-1913 : a place to gather" by Betsy H. Woodman offers a history of these events.